That sets the goal for 2010! I haven’t blogged here for a while … because I’ve been doing a lot of posting at mLearning Africa, which I started in May. It’s about news, projects and research about mobile learning in Africa. Check it out! 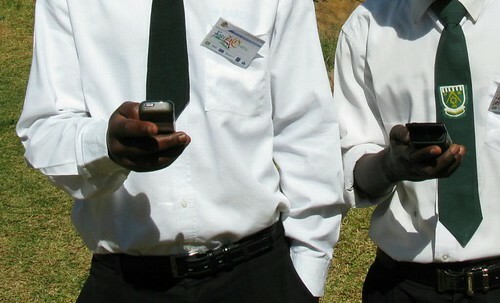 I also recently attended a mobile learning summit in Zambia called Go Mobile! Check out an interview, posts and images from that. Last week I had the pleasure of lunching at Google in New York. My friend, Bruce Falck, who works there took me on a bit of a tour around the offices. He used to be based at HQ in Mountain View — aka the Googleplex — and showed me around there when I was studying at Stanford. It’s huge! Google rents space in the New York Port Authority, which has the largest footprint in Manhattan. 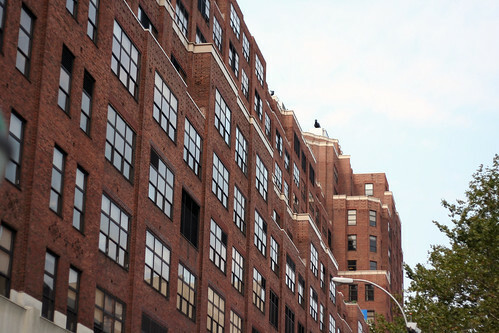 The building is a full city block, and if you know how long a block of the Avenues is, you’ll appreciate how long it takes to walk from one end of the floor to the other. Which is why there are push wheelies to scoot around on. And outside the cafeterias are racks to park the wheelies. The office space is mostly open plan. But this is no dour cubicle farm. The space is highly customised. Googlers stick up posters of their favourite bands, skateboards or even muppets. One section had a wall covered in about 200 vinyl records. Every desk also has it’s array of personalised paraphernalia. The engineers (software developers) have Macbooks for portability and PCs on their desks. Often desks are covered in hardware being tested or developed for. Google runs Goobuntu Linux, a slightly customised version of Ubuntu. Each meeting room has four screens for video conferencing. I peered into a meeting and the images being beamed from other parts of the world were chrystal clear. Oh, the bandwidth! The games room is huge, with foosball, ping pong, arcade games, console games (Playstation, Wii, etc. ), loungers, etc. And then there’s the food. An incredible selection of salads, antipasti, roast meets, fish, home-cooking, desserts and drinks. All free, of course. When Bruce began working for Google there were 5,000 employees. That number is now around 20,000. It remains one of the most difficult companies to get hired at in the world. As I walked around the building — seeing the giant that is Google at work — I was reminded of a Nokia ad campaign with the tagline “intelligence everywhere.” These are bright people doing very cool, world-changing stuff. What is impressive is how accommodating the company is: basically you can do what you like with your desk space, wear what you like or make extensive use of the games room. I even noticed a group of Jewish employees praying in one of the meeting rooms. As long as you do your work, and do it well, it’s all good. My esteemed colleague. Steve Song, has written a blog post about an Annotate-ipedia, a shared mechanism to annotate content on the web. It is only an idea at this stage, but a damn good one. We first discussed this concept last year when considering submitting a paper to Innovate journal’s forthcoming special edition on the Future of the Textbook. Over the holidays I read Charles Dickens’ A Tale of Two Cities. My copy has an introduction and notes by Richard Maxwell. While the book is brilliant, the notes really made reading it a richer, more enjoyable experience. They set the context, explained links to real people (the novel is historically factual), framed the theme within Dickens’ own personal struggles, etc. But how much better if I could read notes from others? From school teachers, historians, Dickens’ fans and teens? How cool would it not be if I could ask a question about a particular historical point and have it answered right there, alongside the text? Then the book could become a resource for History students learning about the French Revolution as well as English language learners. The Schools ICT conference was held from 1-3 October 2008 in Cape Town. In addition to my blog post about the conference, notes about other interesting presentations are below. Laura Butgereit, Meraka Institute. Download presentation (5.6Mb). The thumb tribe is everywhere. You recognise them by their poor posture and absent mindedness. MXit: 45% of subscribers are 12-18 years old. Would the thumb tribe compete at maths skills competitions on MXit? Dr Math began in January 2007. Now have 3,700 kids using the it. 1 tutor can handle about 100 kids an hour. Over Christmas holidays 2007-08 they added a simple addition competition. The thumb tribe found it within a day and started competing — over the holidays! When someone else beats your best score, you get a message telling you this. Kids were playing at 11:30pm on a Sunday night doing grade 8 geometry. Types of competition: + – / *, prime factors, root of a straight line, real factors of a quadratic, real roots of a quadratic, etc. The kids choose which competition they want to enter. With a Gmail account, any teacher can talk to MXit subscribers (through Google Talk when logged into gmail) for after hour tutoring. Rodney Johnson, Rocklands High School, Mitchells Plain, spoke about how they’d used Kwikwap so set up a WAP site for their school. The site can be managed from the web or cellphone, and can be accessed via both. Handheld Learning was held from 13-15 October 2008 in London, UK. In addition to my blog posts about the conference, notes about interesting presentations, papers and projects are below. At the Handheld Learning 2008 conference: Laurie O’Donnell, Director of Learning and Technology, Learning and Teaching Scotland (LTS), on Putting Philosophy into Practice. Teachers are insecure when considering bringing technology into the classroom. They mostly just prevent it from happening. Learners know more about technology than their teachers. Is today’s education really preparing learners for the future? How to assess web 2.0 creations? There is general consensus on what 21st century learning skills are. To carry on thinking of what the list of skills might entail is becoming less and less productive. The big challenge is how to bring the development of those skills into the schools. She believes that we need to stop designing curricula for young people and start designing with them. 2007: Over 3,000 devices — all with wireless and imaging — in the hands of learners in Wolverhampton. Parents contribute to cost of devices. Learners generally look after the devices. Some learners, especially boys, will only read on screen: ebooks. They can be annotated (notes, drawings). Easily shared (with annotations and questions overlaid). Are sometimes free, e.g. Shakespeare. Can be added to with scanned images or text from the learners. The teacher can easily distribute files to everyone in a class. The teacher can easily receive files (assignments) from the learners. One classroom uses Wii’s Endless Ocean, a game where the player is a scuba diver who explores the ocean. There is only one Wii console in the classroom. To workaround this constraint the teacher has created a number of activities that compliment actual Wiii game play, e.g. Learners have to write a persuasive letter/essay on why they should be one of the key divers in the game. Creative writing: learners have to keep a paper-based diver’s log. They create a diver and write an autobiography for him/her. Pieces also include drawings (art outcomes). Coherence of learning — NB to tie the game-based learning to offline activities, e.g. posters, discussions, etc. Learners were asked to design their own Dr Kawashima’s Brain Training game. The design was in the form of a narrative, written on paper. The game play can be done on one console by the whole class, but the curriculum learning outcomes are enabled around that. The game narrative sets the context for these learning activities. So, games enhance the learning experiences that the teachers have planned. Group spaces: Bebo, Facebook, Tagged, etc. Publishing spaces: LiveJournal, Blogger, Flickr, Photobucket, etc. Performing spaces: Second Life, WoW, Home, etc. Participation spaces: marches, meetings, markets, events, etc. Watching spaces: TV, gigs, theatre, etc. 20 young people between 16-21 years old that are being tracked over 9 months about a change they want to make in their lives, e.g. campaign against Size Zero models. Each person has their own Bebo profile and Flip video cameras. The Battle Front project also has a profile on Bebo that aggregates the others’ content. The participants were chosen through a competition. Mentors who have experience with campaigning and social innovation help the participants. Various media track the participants, e.g. TV. mLearn was held from 8-10 October 2008 in Telford, UK. In addition to my blog posts about the conference, notes about interesting presentations, papers and projects are below. This morning’s mLearn 2008 keynote was titled Towards a pedagogy-driven account of mobile learning by Diana Laurillard, Institute of Education, London Knowledge Lab. Twentieth century learning theories, e.g. social constructivism, constructionism, etc., generally propose the same thing: that the “engine” driving learning is a process of iterative development of an idea by a learner, which he/she refines through proposing it, defending it, questioning it, etc., and ultimately can apply as a concept to other contexts. Laurillard proposed a conversational framework that represents different learning approaches as a way to hold up digital technologies against.Teachers need to challenge what the technologies — which are first and foremost designed for business and leisure — really afford for education and how they support pedagogical requirements. To reverse the direction of purpose: from business- and leisure-driven to pedagogically-driven. How to reach learners that don’t have teachers? We are considering running a MiLK project at next year’s SciFest Africa in Grahamstown. Also see Cipher Cities and Scoot, a treasure hunt using lo-fi tech. Parents and kids play together. In a pilot project, podcasts were found to help “connect” — emotionally — distance education students with a university. The real person voice helped to create a human connection between tutors and students, which reduced both student and tutor anxiety. Lisa Gjedde, Danish School of Education, Aarhus University. Background: mobile learning may offer contextual learning potentials. Games can create user engagement and motivation. In this project, three mobile platforms were developed to help answer the research question: To which extent can MLEs support and enhance collaborative learning? The mobile games include multi-modal learning tasks: auditive, visual, tactile, kinestetic. Player feedback: “You were the one doing it all the time, and not the cellphone … you walked around and did it.” Engagement through: fun, context, collaboration, movement, challenge-level. Learners said that the group work (4 member teams) made them feel positive about collaboration in the future. Gave real-world context to maths. Conclusion: need for further research. LondonMet e-packs (online language learning materials repurposed for use on mobile phones) were developed for adult language learners at London Metropolitan University to support learners after-hours. mLearning offers small, bite-size learning opportunities. Language learning is comprised of many skills that need to be acquired: reading, writing, listening, comprehension, vocabulary, pronounciation, etc. Bite-size learning activities, which constitute a larger lesson, definitely have their place, especially when done in context. Giasemi Vavoula (gv18@le.ac.uk) presented on the challenges associated with researching mobile learning. Fixed space, e.g. classroom, has proven set of ways to assess cognitive learning, e.g. exams. Not so with mobile. Alternatives to measuring outcomes are needed, e.g. learner perceptions (attitudes), assessing learner-created artefacts. But still no consensus on assessment. Mobile technology translates (most often) to personal technology. Can participants really consent to unknown scenarios? Challenge 4: Formal vs informal? “Seeing informal and formal learning as fundamentally separate results in stereotyping and a tendency for the advocates of one to see only the weaknesses of the other. It is more sensible to see attributes of informality and formality as present in all learning situations….The challenge is to identify such attributes, and understand the implications of the interrelationships between them.” Colley, H., Hodkinson, P. & Malcom, J. (2003) Informality and formality in learning: a report for theLearning and Skills Research Centre, p. 8. But with increased velocity in our exposure to information and communication, there is a technological burden. It is important that anyone learning a language notices when they are saying something incorrectly. Suggested process: Notice, record in a diary (consolidate), reflect in a group (hopefully). There is usually not much feedback to teachers about what language learners need “in the world.” This project shows teachers the gaps and how learners are progressing. After showing learners the benefits of noticing (through video examples), they are asked to use (mobile) diaries to capture what they notice when not in class. These diary entries are then discussed in class — physical or virtual. This morning’s mLearn 2008 keynote was titled Communications – anywhere anytime by Dr Mike Short, VP R&D, Telefonica Europe. 95% of 15-24 year olds in European countries have a mobile phone. More stats at GSM World — latest report. Mobile is not going to go away. Web 3.0: All of the above, but in a supported, integrated way. Now the web suggests, services discover. Life happens on the web, which provides storage and processing power. This afternoon’s mLearn 2008 keynote was titled Assessing the value of mobile learning: the evidence challenge by Vanessa Pittard, Director: e-Strategy, Becta. Mobile ICT use in Britain not all rosy. 84% of teachers said that they rarely/never use mobile ICTs to allow learners to work together for school activities. Only 6% of schools have campus-wide wifi. How much time to prepare for the lessons? How long would it have taken to achieve the same lesson without ICTs? Impact on learner capabilities and learning behaviours? There’s a lot to say to stakeholders, but important to focus on learner and learning outcomes. Also, could the same learning have been achieved without the ICTs? Myst2008 — location-based game, played at SciFest in Joensuu. Perhaps play at SciFest in Grahamstown? The MOBO City: A mobile game package for technical language learning — Focus was on teaching technical English vocabulary to students. Based in Iran.